I love it when a document makes me reassess what I think I know. I recently received a copy of some of the documents regarding Patience Anna (Marshall) Roberts application for the pension of Asa Roberts. 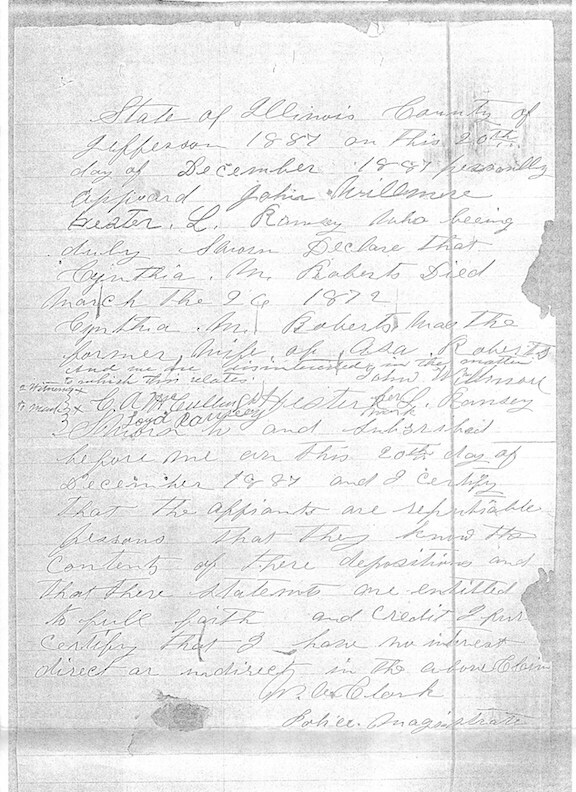 One of the documents was a deposition by John Willmore and Hester Ramsey swearing that Asa’s former wife, Cynthia M Roberts died 26 March 1872. Who? I thought Asa’s first wife was Elizabeth Minerva Toney and she had died on 26 March 1872. I had Elizabeth Minerva because her son’s marriage record said his mother’s name was Elizabeth. So, now I know something is wrong. Are Elizabeth Minerva Roberts and Cynthia Minerva Roberts one person or two? My guess is that Cynthia is the correct name and George’s marriage record is wrong. So, that is how I’ll enter the wife of Asa Roberts, but I’ll still include a note about George’s mother’s name. John Willmore & Hester L Ramsey were alive on 20 Dec 1887. Cynthia M. Roberts, the former wife of Asa Roberts, died 26 Mar 1872. Green text – Emphasis Mine.